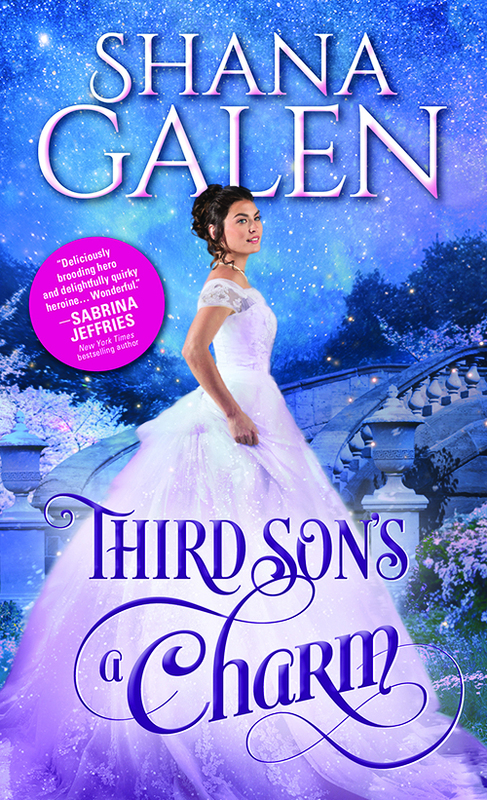 Launching Shana Galen's new The Survivor's historical romance series, Third Son's a Charm is filled with adventure, romance, and a hero who is certain to steal more than a few hearts, mine included. I adored this strong man of few words who struggled to overcome personal challenges and the harsh lessons of his youth delivered by those who were supposed to love him most. Lady Lorraine is exactly the type of person Ewan needs in his life but of whom he doesn't believe he's worthy. However, he can't stand by and watch her waste herself on his no-good cousin. He accepts her father's offer of employment as her bodyguard. His job is to protect her (keep her away) from the fortune-hunting Francis. Lady Lorraine is equally determined to slip the leash and convince her would-be lover to elope without her father's blessing (and money). But, the more time Lorrie spends with her bodyguard, the more she begins to question her charming beau's sincerity as well as her own feelings. Had she been charmed by sweet words with no substance? Could the man of few words be the real love of her heart? 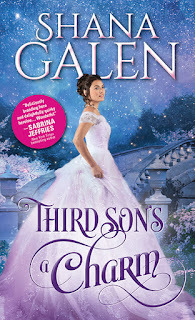 Third Son's a Charm is fast-paced, fun, emotional, and satisfyingly delicious with a lead couple for whom I cheered, a secondary, second-chance romance that warmed my heart, and intriguing glimpses of future heroes in the series. I highly recommend it! Do you enjoy a good battle of wills in your romances? Do you like strong heroes with a vulnerable core? Do you like secondary romances between older characters? I enjoy reading Shana Galen's stories. I love strong heroes with a vulnerable core and a battle of wills makes it more enjoyable. Yes, to all of the above. I always like some angst in my stories - keeps things interesting lol. I like all those things. Sound like a fun read! I really enjoy Ms Galen's books. I had the good fortune to read this book and I must say, every woman should have an Ewan in her life. He is brave, and smart and funny and he does not talk much. Perfect. I can honestly answer yes, yes, and yes. There needs to be a bit of contention in a relationship. It would be rather boring if there were no bumps in a relationship. Strong alphas are fine but a bit overpowering. A bit of softness, if even for a pet dog, makes them more human and approachable. Since I am in the older category, I appreciate it when it is recognized that we do not outgrow our need for love and affection. So give those maiden aunts and widowed uncles, to name a few, a chance. I do enjoy Shana Galen's books. Sounds like another winner for her. I love second chance stories. YES to the other two questions. Yes to all of the above! I wish there were more romance with older characters. I mean, it's fun to read about young couples but I think we need more diversity and that of course includes age. I've never read a book of Shana's that I didn't enjoy. Therefore, I answer a big "YES" to her questions above. This new series sounds wonderful.